Everyone is worried about the eggs in Decorah. Iowa is facing extremely cold temperatures in the weeks to come. While there have been other cold years – 2008, for example, had sub-zero temperatures into early March – this looks like one for the record books. We can’t guarantee that the eggs won’t freeze, but I thought I’d talk a little bit about eggs and cold damage. The zone of heat injury or death: Above 104.9°F or 40.5°C. Optimal temperature, aka the zone of hatching potential: 84.5° to 104.9°F or 35 to 40.5°C. The American Eagle Foundation lists this temperature as 99° for bald eagle eggs incubated in an artificially controlled environment. The zone of disproportionate development: 80.6 to 95°F or 27 to 35°C. Embryos in eggs that spend too much time in this zone can develop unevenly, leading to crippling injuries or death. Successful hatching is greatly reduced. The zone of suspended development: 28.4 to 80.6°F or -2°C to 27°C. Eggs at this temperature don't develop at all. Freshly laid eggs can spend a lot of time at this temperature with no harm to the egg or embryo. The zone of cold injury or death: Below 29°F or -2°C. Although eggs contain a great deal of water, they can get colder than 32°F/0°C without freezing. However, eggs that reach 29°F will freeze, which usually causes death. Some exceptions to this rule have been recorded in Mallard ducks. In the last couple of days before egg-laying, we watched Mom and Dad build a wonderful nest bowl or cup of soft dry grass and shredded cornstalks. The grass conforms to the eggs, wrapping around to provide warm, dry insulation below and around them. Mom and Dad transfer heat from their bodies and regulate temperature by alternately sitting on or standing away from the eggs. Of course, this year has been cold enough that they’ve spent very little time standing. Sitting low in the nest helps keep the eggs and incubating parent warm. One of our facebook fans compared it to Tupperware – a great analogy, since the eggs are cupped below and sealed above. We've also watched the eagles bring in extra cornhusky insulation this year, building their pile as the cold deepens. The eagles may be on to something, since in 2009 the US Department of Energy awarded $200,000 to Husk Insulation, a company that makes insulation from cornhusks. The company's panels are 10 times more effective than conventional insulators like foam. So how warm are Mom and Dad? In a study of overwintering bald eagles, Mark Stahlmaster found that adult bald eagle average body temperatures ranged from 102.2°F, or 38.9°C, to 106.1°F or 41.2°C. Ambient temperature, wind, precipitation (snow can be insulative, but rain is not), shelter, and time of day all had an impact on body temperature. Since the zone of heat injury can be lower than the body temperature of an incubating adult, it’s easy to see why Mom and Dad might (in warmer weather) spend time away from their eggs. Although Dad has taken his share of egg duty this year, I wonder if larger Mom might spend more time incubating in extremely cold weather or at night, when eagles can drop their body temperature to reduce energy loss. Larger animals have an easier time conserving heat, since they have lower area-to volume ratios. While Mom isn’t that much larger than Dad, it might make all the difference in a cold weather event. Lundy’s work was based on artificial incubators, where temperature and humidity can be tightly controlled. Mom and Dad live in the real world, subject to real weather events. Yet they have an excellent record of hatching eggs. Can we guarantee that the eggs won’t freeze or suffer cold damage? As much as we’d like to, we can’t. But Mom and Dad are diligent, experienced parents with a well-built nest cup, a long-term territory, and a good food supply. They are spending a lot of time clamped down on their eggs, applying heat from their very warm bodies directly to the eggs. Unlike us, they don’t need an instruction manual to provide information about temperature regulation, egg-turning, or care. We are watching and hoping for the very best. Go Decorah Mom and Dad! PS: Sherri Elliott has mentioned the difference in the egg ‘line-ups’ - Mom incubates the eggs in a triangular pattern, while Dad incubates them in a straight line. This almost certainly has to do with the size difference between the two (and the overall area of their brood patches), although ‘shapes’ are not uncommon. Like sitting and standing, shapes and positioning can help regulate temperature and keep eggs alive. Stalmaster, Mark V., and James A. Gessaman. "Ecological energetics and foraging behavior of overwintering bald eagles." Ecological Monographs (1984): 407-428. 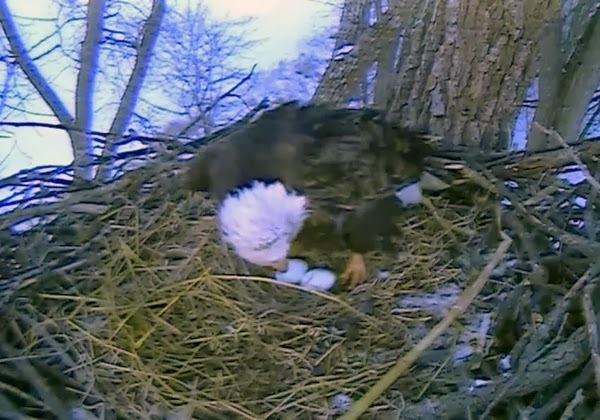 Valentine's Day is here and we're all awaiting the first egg in Decorah. Given that the day is a celebration of things romantic, we thought we would discuss copulation, fertilization, and other egg-related subjects. The video below shows Mom expressing interest in Dad. She twists her tail feathers to the side while vocalizing and rubbing against Dad. In Decorah, courtship activities begin in late fall. Mom and Dad bring sticks and branches into the nest, eventually adding soft nesting material as courtship deepens. Food is (often) shared. The eagles vocalize together and spend more time in close proximity, moving from sitting side by side to gently pecking and footing, wing and tail brushing, and body rubbing with tail twisting and vocals. Mom is letting Dad know in no uncertain terms that she is receptive and ready for copulation. A few people have commented on Dad's 'shyness'. While this is pure speculation, female eagles are larger and stronger than males. Perhaps males want to be absolutely certain females are receptive before getting too close. Bald eagles and peregrine falcons are both birds of prey, but they have slightly different courtship rituals. In both species, the male brings food gifts and both sexes engage in nest-preparation activities. But peregrine falcons incorporate bowing, and bald eagles don't. The video below shows peregrine bowing, which starts around 28 seconds. We should start to see this courtship behavior sometime in mid to late March. Male eagles, like most male birds, lack an external phallus. Bald eagles mate by touching or pressing cloaca together - the famous 'cloacal kiss'. The female perches and tilts forward, allowing the male to land with his feet lodged on her back. She twists and moves her tail feathers to one side so the mounted male can press and twist his cloacal opening around her cloaca, passing sperm from his cloaca to hers. Intense and rapid vocalizations will precede and accompany their mating. As we’ve seen in Decorah and Fort St. Vrain, mating is brief, intense, and takes place fairly frequently while the eagles are in season. So we've gone through courtship and copulation. Now the sperm needs to reach the female's ova at the infundibulum, or site of fertilization. The female is regularly ovulating, but sperm needs to be there when an ovum arrives. If sperm are too early, they will die prior to the arrival of an ovum. If sperm are too late, they can't penetrate the eggshell layers that form around the ovum in the female's oviduct. So how can fertilization be assured, assuming both eagles are fertile? Let's assume that sperm has reached the infundibulum and found a fertile ovum, yolk erupted, waiting for fertilization. Once a sperm fertilizes the yolk, the outer egg membrane seals off the fertile egg, which prevents further sperm entry. The egg begins to drop through the oviduct, a process that lasts for two or more days. As the egg descends, it is coated in layers: eggshell membranes, cuticle layers, and finally the outer crystallization membranes that form what we think of as the eggshell. Viola - a fertile eagle egg ready for laying and incubation! Although we don't know exactly how long egg-laying occurs after mating, it is generally believed that female eagles lay eggs 5-10 days after a successful mating takes place. Since love is clearly in the air at the Decorah nest, we shouldn't have to wait too long. Do Bald Eagles Mate in Flight? Do bald eagles mate in mid-air? Do bald eagles mate through their feet? We’ve been asked those questions on facebook, via email, and at Ustream. The short answer? No. Bald eagles do not mate with their feet or during ‘nuptial flight’. They mate by touching cloacae – the cloacal kiss – while perched securely on a tree limb or in the nest. The male mounts the female’s back, twisting his tail under hers. The two press their cloacae together and sperm passes from his cloaca to hers. As we’ve seen in Decorah and Fort St. Vrain, mating is brief, intense, and takes place fairly frequently while the eagles are in season. Most readers have probably heard of the bald eagle’s whirling nuptial flight. Mates or courting pairs lock talons and whirl through the air, disengaging before they hit the ground. Writers have suggested that this particular courtship activity might prove flight skill, test pair commitment, and/or arouse the eagles to begin mating. While these are lovely ideas, reality is much more complicated. Courting eagles do lock talons and whirl, but so do immature eagles, adult/immature eagles, and adult eagles who (presumably) aren’t courting. Brett Mandernack, the biologist at Eagle Valley, suggested that immature eagle talon locking and whirling flight might be a precursor to adult courtship behavior. While some locking and whirling appears to be antagonistic in nature, like the two adult eagles who crash-landed in Duluth in May of 2013 (http://www.usatoday.com/story/news/nation/2013/05/14/eagles-crash-land-minnesota/2159079/), some is not. Brett has watched territorial adults repeatedly lock talons and whirl, separating before hitting the ground and soaring upward to lock talons and whirl again. “Why,” he asked “would mated adults keep locking and whirling if the behavior was solely antagonistic?” Eagles display remarkable plasticity, varying their behavior in response to environmental changes, including the presence of other eagles. Perhaps talon locking and whirling flight can be made to serve a number of purposes, including courtship. Only the eagles know for sure. We know that eagles who retain a nesting territory and partner are more productive than those that don’t. But to get to that point, an eagle must first settle in a particular area (probably not too far from its own birthplace), establish a nesting territory, and acquire a mate. Soaring displays and vocalization might help an unpaired eagle attract a mate (look at me!) and demonstrate territorial occupation (this is my place!). Talon-locking followed by whirling flight might provide a non-aggressive response to a potential partner, indicating serious interest. If the eagles pair, food gifts and other courtship activities will quickly follow. In Decorah, courtship activities begin in late fall. Mom and Dad bring sticks and branches into the nest, eventually adding soft nesting material as courtship deepens. Food is (often) shared. The eagles vocalize together, spend more time in close proximity, and gently peck and foot to indicate their interest in one another. In late January or early February, all of this activity will culminate in copulation, with egg-laying beginning roughly 2 weeks later. Note: This is a pretty frank discussion that includes a video.